When coffee shops and bars need to choose a coffee grinder, they aim to serve the freshest coffee possible and provide customers with a brew full of flavour to set apart from their closest competitors. For your coffee shop, with the use of a grinder you can decide how fine of grind you want which gives you the chance to use any type of brewer you like from Turkish coffee all the way to a French press. By adjusting the grind, you can control the speed at which the water passes through the coffee grains with fine grains, being slower and coarse, faster. The setting has to be adjusted and checked frequently because with use, the blade efficiency changes and so will the size of the ground grains. One of the toughest choices is whether to buy an integrated grinder or a separate one. But what do you keep in mind? 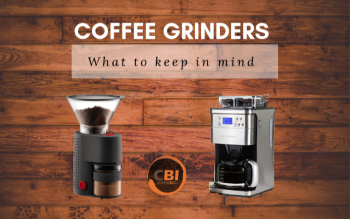 When you buy a grinder, whether integrated or separated one, you should analyze pros and cons of each one. You should pay attention at a series of characteristics that your grinder should have. Below is a check list that could help you in the choice of the best one for you. For a beginner, an integrated grinder could be much easier to use. If you want optimize the use kitchen or café bench tops, there are some integrated grinder that enables you to save quite a lot of space. If you want to save money, sometimes it is cheaper to buy a coffee machine with an integrated grinder instead of 2 separate appliances. Pay attention that the integrated model you choose,does not allow you to brew anything but just one style of coffee. 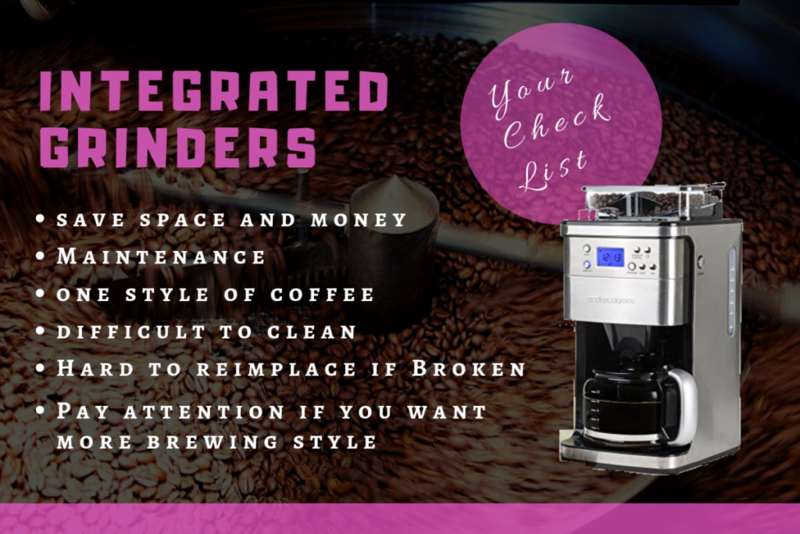 Your machine shouldn’t be difficult to clean so you should verify if it is harder to change beans as it could be difficult to reach the bottom of the machine to clean it properly and in most cases will limit you to a single type of coffee grind. It is important for a careful maintenance, since in worst case scenario, sometimes if your grinder breakdown means replacing the whole machine. 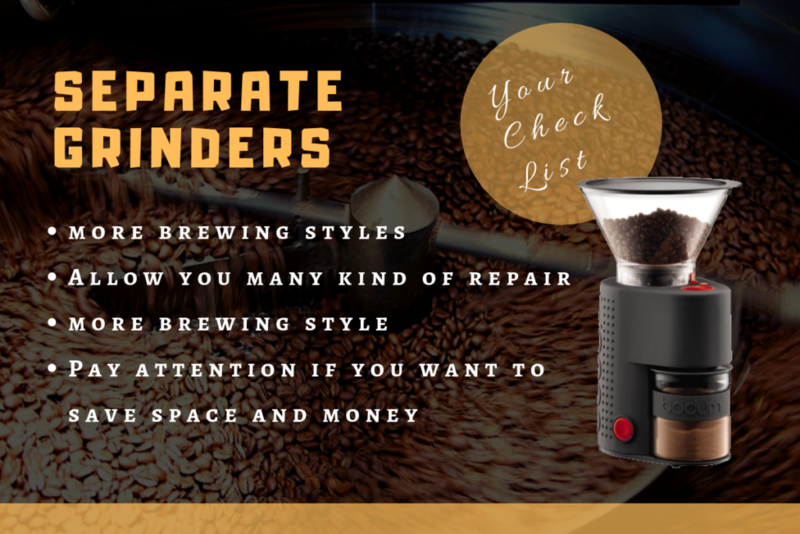 If you want more brewing style, the separate grinder is ideal, since you can not only brew espresso, but drip coffee, and several other kinds, all with one grinder. When your choice is a separate grinder you should consider that, in case of breakdown, it should be of many kind repair. If you want to save space and money, pay attention because 2 separate appliances could take more space and be more expensive for you. 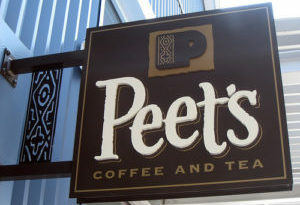 Telematry in coffee machines and grinders. 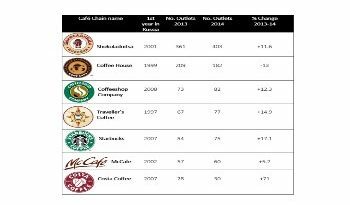 The technological addition to reach coffee machines is telemetry. A few different companies around the world have started offering machines that can be controlled remotely and are equipped with a telemetry system which allows for productivity reports to be created, maintenance and malfunctions alerts and much more. 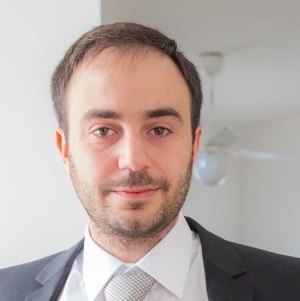 All the collected data is sent to a web platform on which all the statistical analyses are made: we can retrieve information about the type and amount of brew made and technicians are able to monitor the machine 24/7 and remotely solve simple issues. Many of this new system now support over the air updates, giving producers a chance to fix any bug that many arise in the pre-installed software or add new features over time. 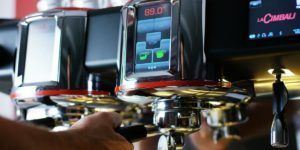 The owner or operator of the coffee machine will also be able to modify parameters such as water or milk temperature or grind details at the touch of a button via a phone application. Other tips? Join our B2B Community to keep in touch and receive further tips. ← Tradition clashes with innovation, the Turkish coffee market.